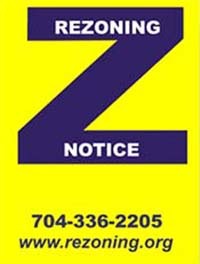 (March 29, 2019) The next zoning meeting of the Charlotte City Council will begin at 5:30 PM on April 15 at the Government Center (600 East 4th Street). You may view this meeting, the agenda, and past meetings online HERE. To sign up to speak at the Public Hearing, complete the online form HERE. 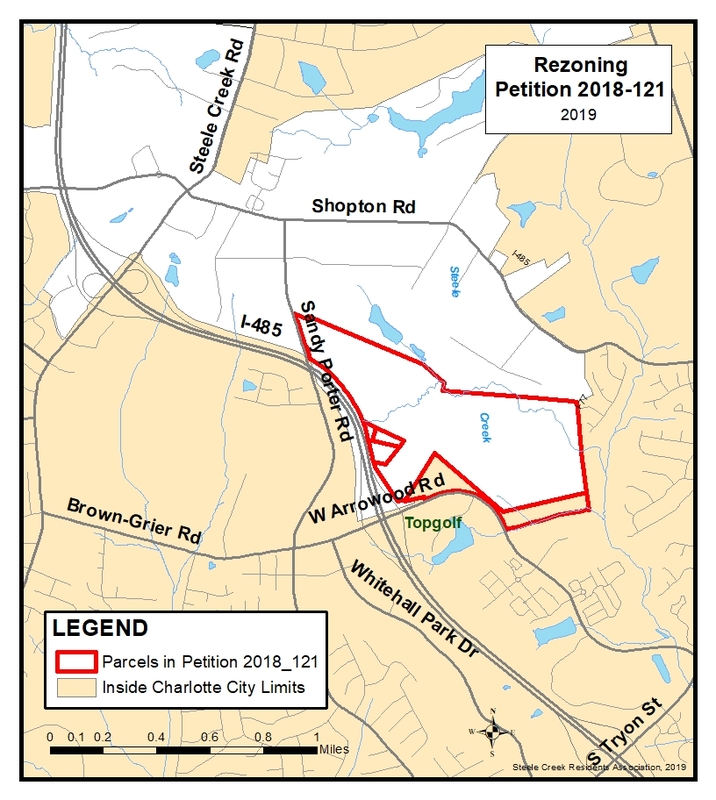 The Charlotte City Council is expected to make a decision on the following petition at its April 15 meeting. 2018-121 - Mixed use development on approximately 265 acres east of Sandy Porter Road and I-485 and north of Arrowood Road, across from the entrance to Topgolf. Uses requested include up to 73,000 square feet office, retail, restaurant, and other commercial uses, a hotel, up to 270 residential units, and up to 2,000,000 square feet of warehouse, distribution, and other permitted uses. Petitioner will provide various road and intersection upgrades, including signals at the development entrance on Sandy Porter Road and at the development entrance on Arrowood Road (across from Topgolf). Parcel # 20105106, 20105108, and 20145101. This property was previously rezoned in 2013 to allow construction of a billboard for the Outlet Mall on I-485. See Petition 2013-002. 2018-110 - Mattamy Homes plans to build up to 240 townhomes on a 38.4 acre site on the east side of Shopton Road West, north of South Tryon Street. and west of the McDowell Place and Charlotte Pines neighborhoods. Current zoning at 3 units per acre allows up to 115 single family homes. Mattamy plans up to 240 townhomes, which would be 6.25 units per acre. Homes would have 1 or 2 car garages and be in the same style as the townhomes near the Berewick Manor House. They plan buffers with adjoining neighborhoods. The Public Hearing is scheduled for April 15. Parcel # 19901102. 2018-146 - Single family development on the east side of Shopton Road West just north of Sledge Road. Plans call for 48 units oriented towards baby boomers on 18.39 acres ( 2.61 units per acre). This is less than the 3 units per acre allowed by current zoning. The MX-1 zoning would allow innovative features, such as smaller lot size, on-street parking, and alleys. The plans include significant tree save areas. Parcel # 19911106. Developers also plan to build single family housing on Parcel # 19911103 to the north, which does not require rezoning. The two new sections would connect to Chapel Cove subdivision to the north but not be part of Chapel Cove. The northern section would have road access to Shopton Road West. 2018-155 - Hotel(s) and offices, including "light assembly of computers, tablets, and their components" on the extension of Dixie River Rd east of the Bojangles, dentist office, and the BP near the Berewick Town Center. Parcel # 20109115. 2019-012 - Lidl plans to build a grocery on the SW corner of S Tryon St and Moss Rd (across from Good Shepherd UMC). The rezoning petition is a site plan amendment to revise previous zoning approved for a Pep Boys store. Lidl dropped previous plans to build near the Berewick Town Center. At 29,000 sq ft, this store will be smaller than the earlier planned Lidl. Road improvements, including intersection improvements, are anticipated. Parcel # 21901105. 2019-016 - Lennar Homes plans to build at least 200 townhomes on 42 acres on the south side of Hamilton Road between S J Lawrence Road and Smith Boyd Road. They are requesting a zoning change from R-3 to UR-2(CD). Parcel # 21926112. The following petitions in Steele Creek are outstanding. None have had Public Hearings scheduled. 2017-065 - Apartments at the end of Rigsby Road east of Clearview Acres subdivision off Steele Creek Road south of I-485 near the Berewick Town Center. Parcel # 20107504. 2019-030 - Up to 324 apartments on 30.73 acres north of S Tryon Street and southwest of Erwin Road. Petitioner is requesting a change from R-3 to UR-2(CD). Parcel # 20122103 and 20122117. Shopton Rd. West, north of Sledge Rd. 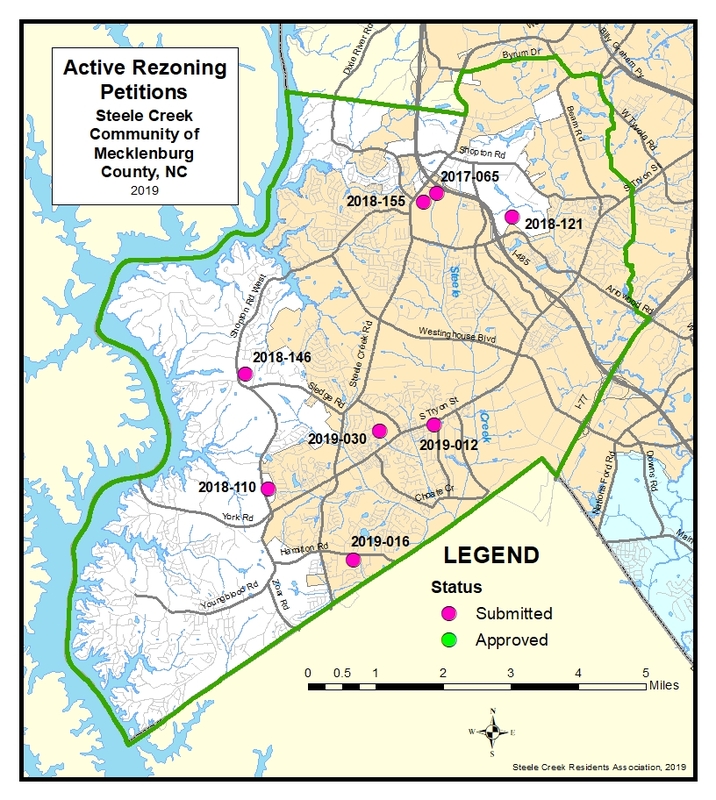 See the location of current rezoning petitions on the map below. For more detail, see Polaris 3G, The County's Premiere Real Estate Mapping Tool featuring property info, assessed values, sales, and a lot more! To comment on this story, please visit the Steele Creek Residents Association Facebook Page.